Suzy, Sean and I were headed to Peoria to visit Sean’s grandparents from Monday to Wednesday and had a busy Sunday planned. I wanted to check in on the falcons. Sean had to do a bit of work email. We all wanted to go over to Blues Fest in Grant Park. Suzy wanted to see the falcons. We had packing and various household chores. And months before, Suzy had purchased Sox tickets and the game was at 7pm. We had a lot to accomplish. 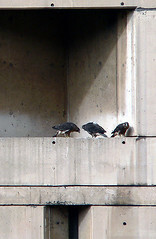 Three chicks perched on the nest ledge… Ah, crap! My office just sprang a leak! Back now. Sorry. My office springing a leak had nothing to do with falcons. But, what a mess. Anyway. Where was I. Oh yeah. 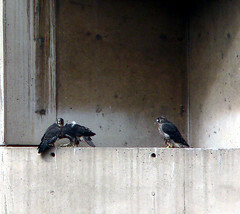 Three chicks perched on the nest ledge, jostling each other as they all tried to pace back and forth. I could not see Hercules anywhere, but Max sat on the stairwell roof sleepily watching the activity across the way. Having learned my lesson well the day before, I stayed back while I was on the roof. It began sprinkling again and I went to the 11th floor. I snapped quite a few pictures of the three chicks while idly wondering where the fourth chick was. As I watched, I noticed that the largest female almost seemed to be policing the male. Every time he would move, she would wait for him to settle and then go over and nudge him around. He switched from the east side of the ledge to west side, back and forth, but she would not leave him alone. I bet she’s getting him back for being a pest in the nest. After an hour, Max soared in and landed on the ledge. He had prey with him, but dropped very quickly into the nest with it, so I did not see what he had. All the chicks but the largest female piled in after him, vocalizing loudly. Max came out of the nest seconds later and the biggest female tried to police him too! She must be the sheriff of that there nest. She certainly doesn’t take any tomfoolery. Max didn’t look too impressed a she flattened herself down in a menacing manner and squabbled at him. Finally, he leaned over and, at least from my angle, looked like he touched his beak to hers before taking off again. Anyway, the above picture illustrates just how very full grown the chicks are at this age. If she didn’t have the zany juvenile plumage and random puffs of down scattered over her back, she’d look just like Max. Finally, she dropped down into the nest and all was quiet. 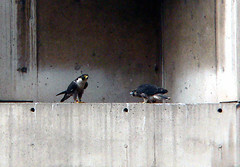 In fifteen minutes or so, the male came back out. He flapped around for a few, enjoying the sister-free ledge before the largest female – Miss Police State – came out and put and end to that noise. The two sat very primly side by side for most of the remainder of my time there, which gave me time to really contemplate the amazing size difference between the two. Just as I began packing up, the largest female prepared to go back into the nest. As soon as she had her back turned, the male turned to her and flared his wings out. For all the world, it looked like he was mocking her. I am really starting to dig the male’s personality. He seems mischievous. Laughing, I packed up and wandered home. We spent the day at the Blues Fest, good times were had and then it was time to take Suzy up to see the falcons. 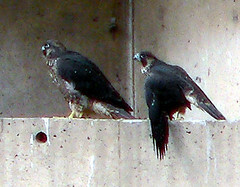 ‘Lo and behold, four chicks perched on the ledge! Sean, Suzy and I were very excited to see that the last chick had finally come out of the nest. The ledge was sure getting crowded! The “crowded ledge” picture below gives a better perspective on that as it isn’t cropped and is taken at 12x magnification. 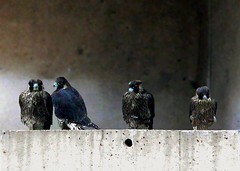 Anyway, with the ledge that crowded, it is no wonder Herc and Max spend very little time at the nest. The babies suitably impressed Sean and Suzy but then it started drizzling again, so we trudged home, hoping the Sox game later that evening wasn’t going to get called. As it turns out, it didn’t, but it was one of the coldest games I’ve ever been to. Fun anyway, though. ~ by Steph on June 11, 2006.